Apple will host a press event on its California campus March 21, perhaps to unveil new iPads and possibly a long-rumored smaller 4-in. iPhone, according to reports. Invitations went out Thursday for the presentation, which will start at 10 a.m. PT (1 p.m. ET) in a small venue at Apple's Cupertino, Calif. headquarters. 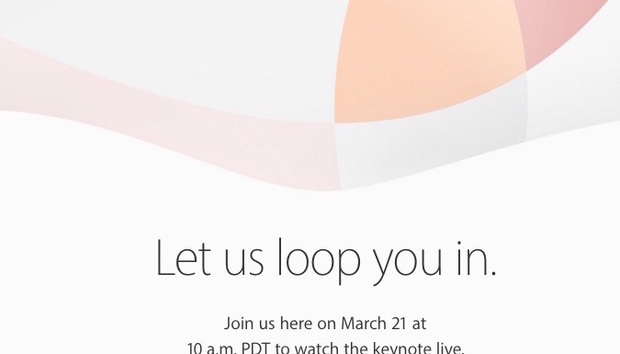 Apple will, as has been its habit, live-stream the event from its website. The company's spring events have typically involved new iPad tablets, and recent rumors have focused on a 9.7-in. iPad update from the iPad Air (Amazon prices) that may be aligned with the larger 12.9-in. tablet (Amazon price) as a second model in the "Pro" line. Apple last refreshed the 9.7-in. tablet in October 2014, when it introduced the iPad Air 2 (Amazon prices). Also possibly on the March 21 docket: a smaller 4-in. iPhone, perhaps labeled with the "SE" nameplate, a moniker that has some history with Apple. In 1987, nearly two decades before the company became known for the iPhone, it released the Macintosh SE, a personal computer that was a revamp of the 1986 Macintosh Plus, which boasted an enclosure similar but was not identical to the original 1984 Macintosh. Speculation about a 4-in. iPhone has circulated since 2014, when Apple abandoned that form factor and upsized the display in its then-new iPhone 6 (and current 6s) to 4.7-in. Apple has continued to sell smaller models, however, by retaining older iPhones in its catalog. For instance, Apple still sells 2013's iPhone 5S, which sports a 4-in. display. Launching a new iPhone in the spring would be a departure for Apple, which has debuted updated hardware in September since 2011's iPhone 4S. "The off cycle has become more and more critical to Apple," said Carolina Milanesi, chief of research for Kantar WorldPanel Comtech. "They want to spread sales throughout the year." Apple has had a problem maintaining sales after the initial boom of a new product launch, with the second and third quarters historically slumping from the fourth and first quarters, during which sales of the latest flagship dominate revenue. By introducing a new model in March, Apple may be able to increase revenue during a historically down time. A smaller device would also show that Apple has recognized that its larger phones are not covering enough of the potential market. "There are people out there who want smaller devices," asserted Milanesi.